In the past, home plans with an elevator were a luxury for those who have a physical disability. Now, home elevators are a desired luxury item that adds uniqueness and universal appeal to home designs with multiple floors. Young couples and families can enjoy the benefits of this special feature just as much as a mature individual. As lot sizes continue to shrink and home square footages continue to get larger, what does that mean? People are having to build up in order to obtain the square footage they desire in a dream home. Chances are, that involves at least one flight of stairs if not more. 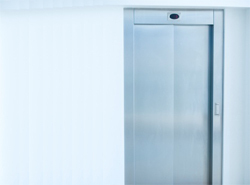 An elevator can increase a home’s value, its accessibility and convenience for everyone. The Neva Canyon Modern Home has 3 bedrooms, 2 full baths and 1 half bath. 2737 Sq. Ft., Width 74'-0", Depth 39'-0"
The Powers Hill Luxury Home has 5 bedrooms, 5 full baths and 1 half bath. 6349 Sq. Ft., Width 110'-10", Depth 98'-7"
The has 4 bedrooms and 5 full baths. 4839 Sq. Ft., Width 62'-9", Depth 89'-8"
4066 Sq. Ft., Width 40'-0", Depth 88'-8"
3209 Sq. Ft., Width 71'-0", Depth 38'-8"
The Donatella Luxury Home has 4 bedrooms, 3 full baths and 2 half baths. 5043 Sq. Ft., Width 154'-6", Depth 72'-6"
The Young Prairie Modern Home has 4 bedrooms, 4 full baths and 1 half bath. 4831 Sq. Ft., Width 123'-0", Depth 75'-10"
House Plans and More features many house plans with elevators. We offer detailed floor plans that help the buyer see exactly how their dream home will be designed, down to even the smallest detail. With a wide variety of plans to choose from, see our collection of home plans with an elevator and find the perfect one for you.